Can you win the loser’s game? You’ll also learn exactly what this book is about, so by the time you’re done reading this review you should be able to confidently decide if this is the right investing book for you. Sound good? 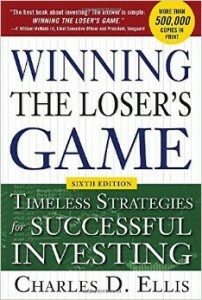 Winning the Loser’s Game is a classic guide to winning on Wall Street. And if anything, this book is even more relevant today, than when it was first published in 1998. This updated edition also helps investors apply the advice in a contemporary manner. It also reinforces the initial findings. by proving they’re standing the test of time. So let me tell you what you should expect. First off, Winning The Loser’s Game explains exactly what a loser’s game is. The premise is simple: loser’s games are those that you win by avoiding mistakes, rather than taking a positive action. Think about golf, or amateur tennis. In those sports, most of the time the winner is the person who makes the fewest mistakes. So how does this apply to the stock market? Ellis argues in Winning The Loser’s Game that over the last 10-20 years, professional investing has become a loser’s game. It wasn’t always that way. But now there are so many intelligent professionals studying so hard, that trying to outperform the market has become a loser’s game. And to make matters worse, avoiding mistakes isn’t easy! So what’s an investor to do? Well, luckily Winning The Loser’s Game doesn’t just talk about the challenge facing today’s stock market investor. The book also proposes a new way of thinking about the markets and the steps you can take to turn investing into a winner’s game. So how does it work? The main thrust of Winning The Loser’s Game is that instead of trying to beat the market, you should make the market work for you. You can do this by carefully defining your investing (or retirement) goals. That’s the most important step. In order to win, you need to define what winning looks like for you! Then, based on your risk tolerance, conservative expectations of returns and passive low-fee asset allocation you can build a diversified portfolio that will get you where you need to be. Make sense? Ellis really tries to hammer home the point that asset allocation, realistic expectations and understanding your risk tolerance (or being able to stick with your long term plan) are the key to making investing a winner’s game. Winning The Loser’s Game is also very well written. It’s concise, reads quickly and is to remember. As you probably know, some finance books can be quite boring. That’s why I like to give extra points to those that are easy to understand and a little entertaining. So are you getting hungry to read this book yet? Well, hold on a second. We still haven’t gotten to my favourite part of this book. Do you want to hear it? If you ask me, the best part about Winning the Loser’s Game is the way it reframes a lot of common issues. In a lot of ways, it’s very similar to A Random Walk Down Wall Street. But Charlie Ellis’ book explores this tired topic from a refreshing angle. To be honest, I like the way Winning The Loser’s Game is upfront about how hard consistent outperformance by active management is. Ellis doesn’t deny the facts. But he also gives hope and provides a compelling and actionable roadmap for how, even without beating the market, you can use investing savvy to achieve everything you’d ever need to have a rich and fulfilling life. Of course, as someone who runs a blog about stock ideas, you have to expect I have some bias towards active investment management. But even with this outlook, I still really appreciated how this book broached this perennial debate. Usually at this point in my investing book reviews, I try to find something negative to say about the book I’m reviewing in order to provide you with a balanced perspective. But in the case of Winning The Loser’s Game, I really can’t complain. The book is smart, focused and communicates the compelling message clearly. Hard to argue with that, right? By now, you are probably getting the feeling that Winning The Loser’s Game is a book worth reading. And if you have a serious interest in investing, you’re probably right to check it out. I’d also like to re-emphasize that the author of the book is also an incredibly successful investor who you can certainly learn from. For these reasons, I recommend checking out Winning The Loser’s Game on Amazon today. On the other hand, if you’re still a little unsure about whether or not Winning The Loser’s Game is the right book for you, I encourage you to check out the video book review below. This should give you even more great information on Winning The Loser’s Game. This entry was posted in Stock Ideas and tagged investment book reviews on July 6, 2015 by Jworthy.